← How Does the Evolution of the 2012/13 El Niño Stack Up Against the Others since 1982? Thanks to blogger timetochooseagain for his comment at the WattsUpWithThat cross post. During their discussion of the model portrayal of El Niño and La Niña events, Guilyardi et al (2009) use the term “skewness”. With skewness, they’re referring to the fact that since 1976, for example, El Niño events have been stronger than La Niña events, and it can change over decadal periods, with La Niña becoming stronger than El Niño at times. In other words, ENSO can be skewed toward the El Niño or La Niña for multidecadal periods. But as Guilyardi et al (2009) discuss, they’re not in the climate models. Modeled La Niña events tend to be the same strength as El Niño events. Let’s take that further. If the models also produce the same number of La Niña events as El Niño events, then modeled ENSO would become a nonentity. Is this the reason why models show the equatorial Pacific warming nearly as fast as, or faster than, the mid latitudes, depending on model vintage? (See Figure 1, which is Figure 5-37 from my upcoming book.) 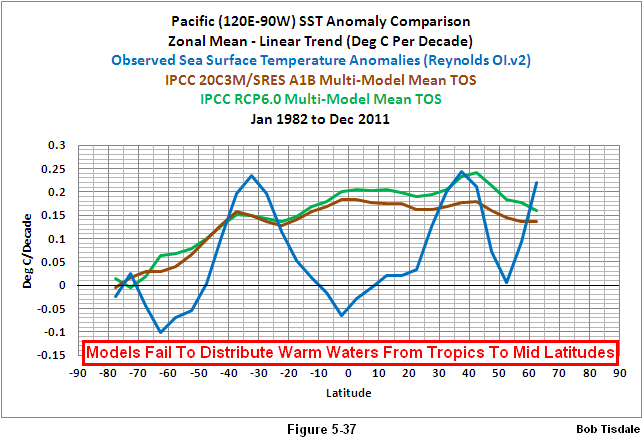 When in reality, the equatorial Pacific has cooled over the past 30 years, while the mid latitudes have warmed. This indicates to me that in the real world, ENSO-related processes are distributing warm water from the tropics toward the mid latitudes in the Pacific—something that’s not captured by the models. And that’s a big problem. This entry was posted in Climate Model Problems, El Nino-La Nina Processes. Bookmark the permalink. Somewhat O/T, but have you seen the article in July 6 Science by Toth et al titled ENSO drove 2500-year collapse of eastern Pacific coral reefs? Lance Wallace: Thanks for the heads-up on Toth et al. No one has the slightest clue what ENSO will do five years from now, and they’re claiming to know what will happen farther in the future. There’s no evidence that ENSO has been impacted by rising sea surface temperatures (ENSO’s likely the cause for it). Their claims are simply speculation. However, there has always been one part of your ENSO-warming theory that I’ve pondered, wrt the ENSO warming step functions. Is it possible that prior to modern high CO2 levels, the SST norm was to fall gradually during neutral or La Nina conditions and increment during El Nino to maintain a long term average?. And now under higher CO2 we see a flat SST under neutral or La Nina conditions, with an always increasing step function increase caused by El Nino ? Of course the SST and ENSO records were not so accurate before 1980 so it’s probably only possible to speculate. John Moore: Let’s divide the global oceans into three subsets. The North Atlantic has the additional variability of the AMO on top of the warming of the other ocean basins. There is evidence that its warming may have peaked already so the North Atlantic’s influence on global sea surface temperatures should slow and then reverse. From the mid-1940s to the mid-197os, the North Atlantic was experiencing minor cooling, so it helped to slow the warming rate of the global oceans. Do we expect that to happen again? I can’t see any reason why it won’t. The South Atlantic-Indian-West Pacific data is where those upward steps occur. Basically, the upward steps are related to the amount of warm water that’s left over after the major El Niño events. The warm water gets carried into the west Pacific and eastern Indian Oceans and then migrates from there. Some of warm water starts on the surface, and some of that warm water was originally below the surface and rose to the surface via gravity as years passed. There were no super El Niño events, as far as the SST records show, during the mid-1940s to mid-1970s cooling period so there are no references during that period for the upward shifts. If we don’t have any more super El Niño events, and if we’re now shifting over to a period when even lesser El Niño events occur less often, then that South Atlantic-Indian-West Pacific subset SHOULD flatten. I know your question pertained to those periods between the major El Niño events and whether CO2 is influencing how quickly that subset cools between them. That’s why I prefaced the answer with those two subsets. Because it leads us to the question: is there any evidence that CO2 warms the global oceans? The fact that the East Pacific Ocean has not warmed in 30 years really contradicts the assumption that CO2 drives the warming of the global oceans. It throws a wrench in the whole works. It’s really tough to show that CO2-related downward longwave radiation has any impact on sea surface temperatures with the East Pacific data so flat. The models tell us that subset should have warmed about 0.42 deg C to 0.45 deg C, but it hasn’t warmed at all. Bob, i am looking for your email. would you mind using my email and sending me an email? i would like to ask you a question about AGW and make a few suggestions for future posts. Thanks! Texan in Africa: Any reason you can’t ask the question and make the suggestions in a comment? That way if someone has a similar question or interest they’ll also find an answer. I’m just about to publish a post that may be a more appropriate place for your question. A couple of minutes, please. Pingback: Our Climate Models Are Aglow with Whirling, Transient Nodes of Thought Careening through a Cosmic Vapor of Invention | Watts Up With That? Pingback: New Paper Claims Extreme La Niñas to Become More Frequent under Global Warming | Watts Up With That?